Trolls are naturally merry souls. Bergens have a culture of misery alleviated by the festival of Trollstice. They believe that by eating trolls they will absorb their happiness. As trolls are leaf size and Bergens are giants by comparison, it takes a lot of bite-size creatures to feed an entire Bergen town. The trolls live in constant fear, until the night of the great escape when Bergen Chef’s showcase banquet is thwarted. The trolls find a new home deep in the forest and the Chef (Christina Baranski) is banished. Fast forward 20 years and Princess Poppy (Anna Kendrick) is grown up. She can scarcely remember the day she was scheduled to be fed to Bergen baby Prince Gristle on the occasion of what was to be his initiation by his father (John Cleese) into the troll Happy Meal experience. 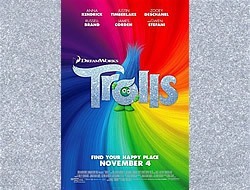 The trolls devote themselves to music and dance, hugging and scrapbooking. All except for one. Branch has not forgotten the Bergens or recovered from the terrible ordeal that turned him colourless. He stands out among his neon tribe, paranoid and depressed. His is the lone voice of warning when Poppy plans a mega-blast party (DJ’d by Gwen Steffani as Suki) that will likely attract the attention of their predators. Sure enough, the loud light and magic show fills the sky and the trolls are spotted. Only Branch’s secret bunker saves most of his friends from the Bergen menu. However, a small group are captured. Poppy seeks Branch’s help, but sets out alone through a dangerous psychedelic wood where she is joined in the nick of time by Branch. From here Miss Bubbly and Mr Flat venture into the heart of enemy territory. There, their sole ally is a Cinderella of a Bergen called Bridget (Zooey Deschanel) who loves the prince from afar. Enter a collective fairy godmother, a makeover, an abandoned roller skate, the state banquet of Trollstice, a vengeful chef, and a life-changer for the Bergens. The animated troll dolls are imaginatively endowed with tentacle-like hair, chameleon camouflage capabilities, and portrayed by talented vocalists. Ironically, Branch who is voiced by Justin Timberlake claims he doesn’t sing. The re-scoring of 70’s hits with a contemporary spin and a funk feel to the songs written for the film by Justin Timberlake show his hidden creative depths as executive music director. Big Bang Theory fans will welcome the appearance of Kunal Nayyar as sparkling troll Guy Diamond. Russell Brand is the pseudo spiritual Creek who finds himself up it. If you’re near the bottom of the emotional scale Trolls will likely irritate you or make you feel you’re in a glass box. It may wring an unwilling smile or even a laugh from the apathetic and if you’re already feeling pretty ok you will probably tune in to the get happy theme and rise further up the scale. This is feel-good rather than feel-better. If you affectionately remember having a troll on the end of your pencil at school or are a 70’s funk fan, you’ll likely ‘move your feet and feel united’ with Trolls, and consider it worth the price of a couple of hours’ entertainment. Chartreuse is a freelance writer, editor, photographer and promotional videographer. She has written a feel-better film review column for Heath & Happiness Magazine, and is the owner of Heypressto. Chartreuse’ greatest inspiration is Abraham-Hicks. Her favourite quote is ‘You can be, do or have anything you want’.